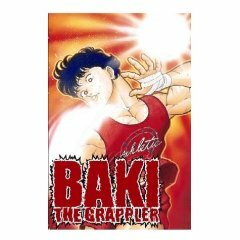 Manga 'Baki the Grappler' de ITAGAKI Keisuke publié chez Gutsoon! His name is Baki Hanma. No one knows where he came from or where he learned his unique fighting style. He can defeat an opponent with a single blow and he's taking the Karate Championship by storm. But now he's in for the fight of his life. Anything goes and his opponent can rip his nerves out — literally. If he wins, he's the best. If he loses... he's dead.